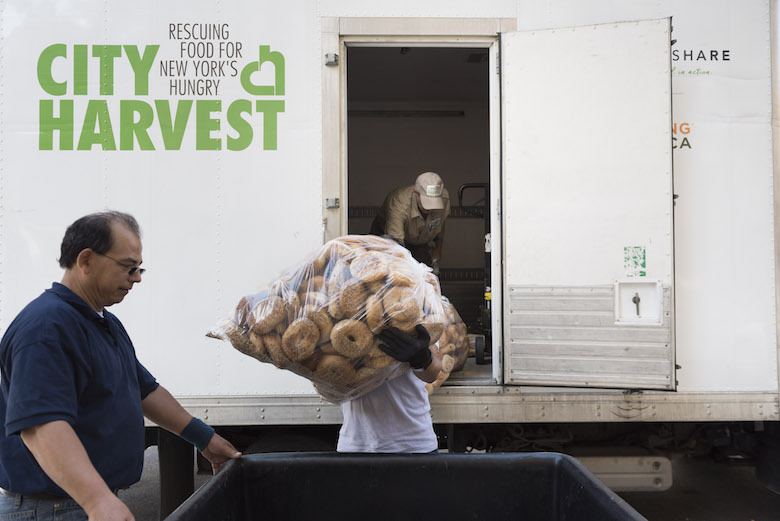 City Harvest has over 160 full-time employees and relies on over 10,000 generous volunteers annually. 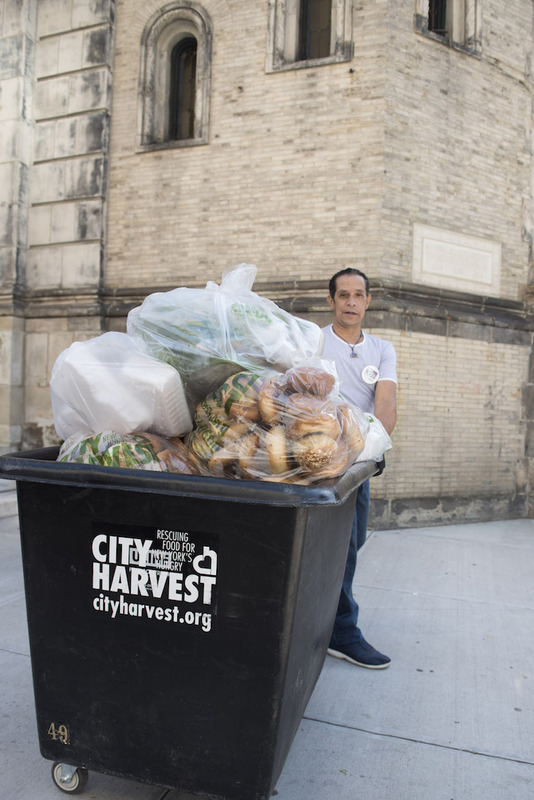 If you’ve ever been at Union Square Greenmarket at closing time, you’ve probably noticed City Harvest’s large rolling bins collecting food donations. 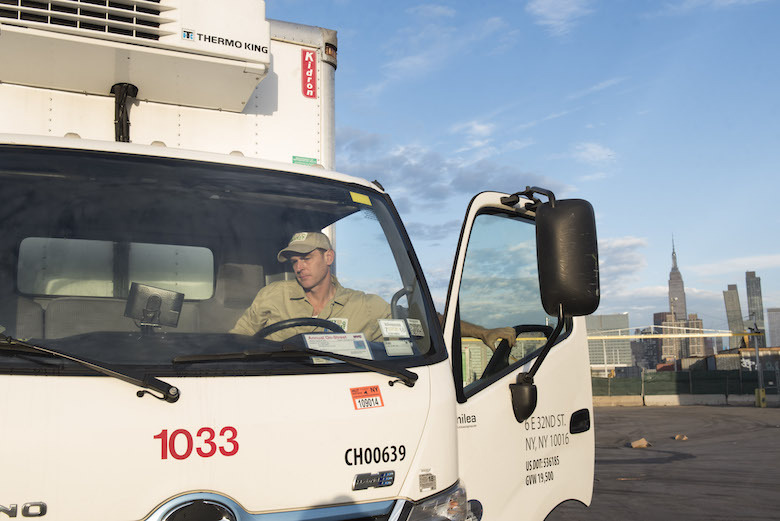 You’ve also probably seen their fleet of hybrid trucks zipping throughout the five boroughs following consistent, calculated paths. 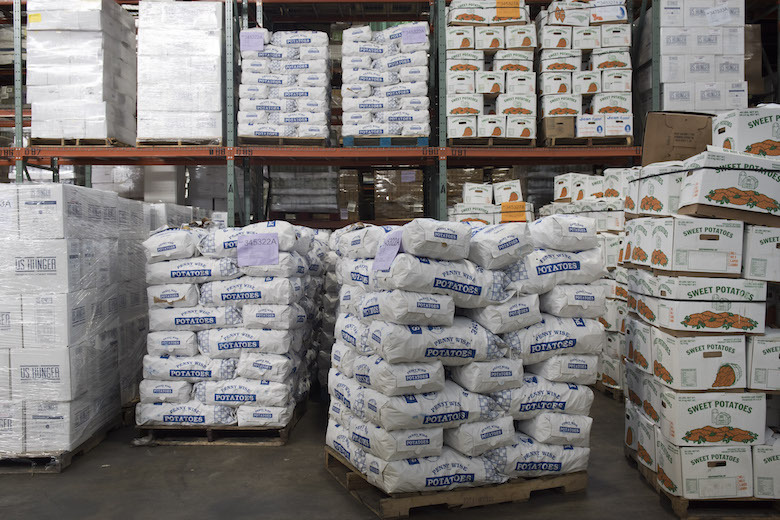 The 35-year-old hunger relief organization may have a very public presence on the city streets, but most New Yorkers know little about just how much food they collect throughout the five boroughs and where it goes. 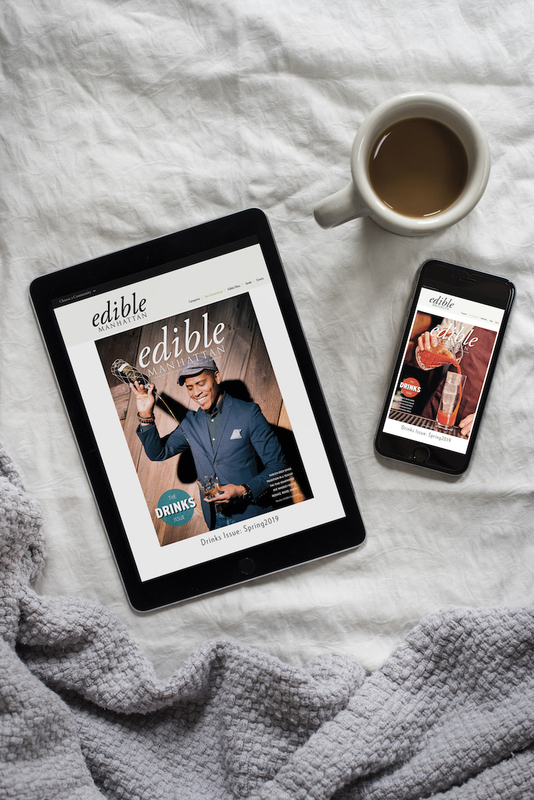 Fifty-nine million pounds of food in 2017—that’s the quantity we are talking here. 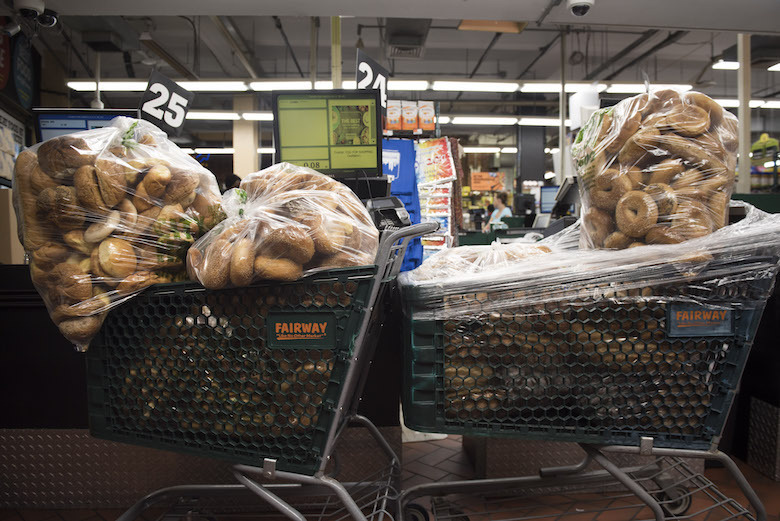 It’s a number so huge and abstract that it’s incomprehensible; just what does 59 million pounds of food look like and, bigger picture, what fraction of the city’s total food waste does it represent? 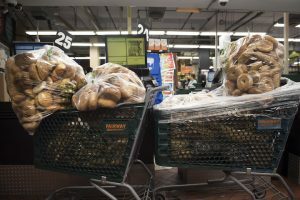 Researchers at the Natural Resources Defense Council are actively crunching on those precise local figures, but to give you a very general sense, 40 percent of all food in the U.S. is wasted every year—that’s roughly 20 pounds of food per person every month. 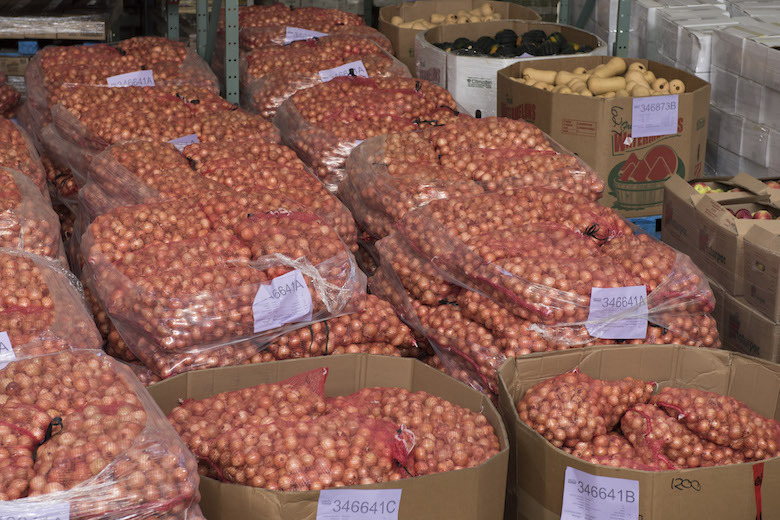 To better visualize City Harvest’s scale, I decided to photograph their 45,000-square-foot Long Island City–based Food Rescue Facility warehouse as well as one of their typical early morning food-rescue and drop-off routes. They graciously let me hop in and out of one of their 14-foot-long box trucks (grateful I wore semi-athletic clothing for that part) to get a rare behind-the-scenes glimpse of their work. 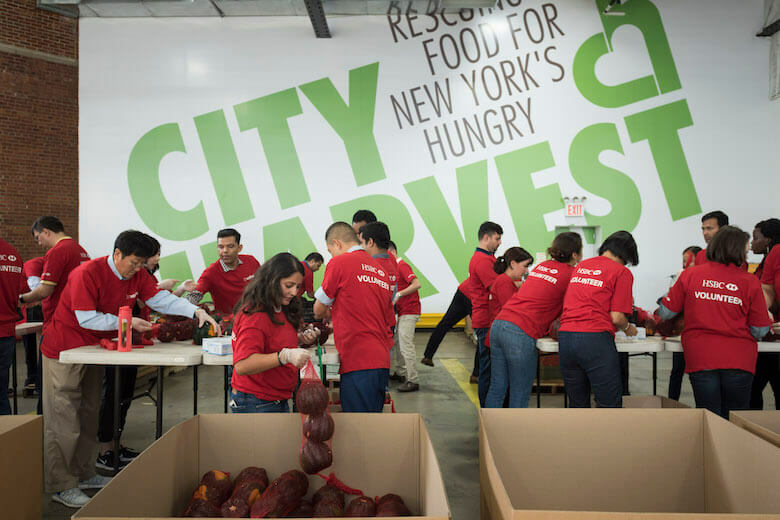 But first some background: City Harvest has over 160 full-time employees and relies on over 10,000 generous volunteers annually. They operate a fleet of 22 refrigerated trucks max that, seven days a week, have set routes to pick up from some 2,500 different farmers markets, grocery stores, grocery delivery services, restaurants, bakeries, manufacturers and sometimes even from other large events (think Fashion Week or food festivals) annually. 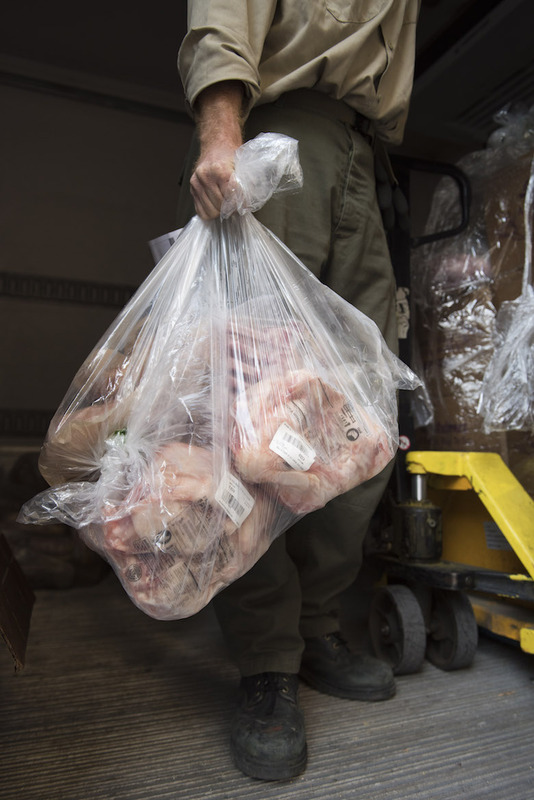 They capture an average of 160,000 pounds of food per day (a huge amount to be sure but only 0.3 percent of that annual 59 million pound figure) and also have to factor in the unexpected, like a call from, say, a major citywide marathon: “We’ve got five pallets of bottled water, can you come pick them up now?” kind of thing. 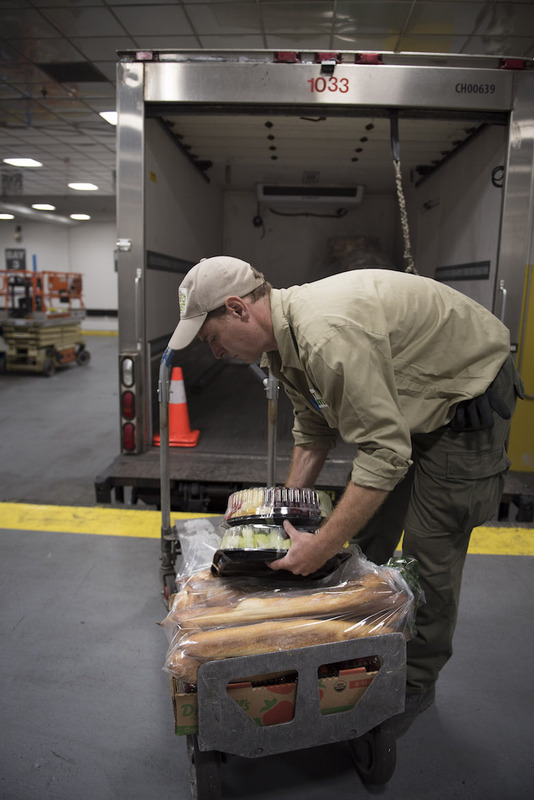 With the truck fully loaded and working as fast as city traffic will allow, they deliver free of charge to over 500 different community programs annually, including soup kitchens, shelters, food pantries and other drop-in centers. 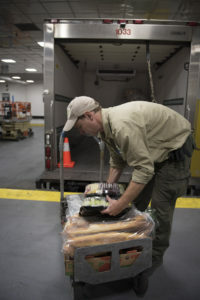 Their trucks ultimately make between 15 and 20 stops a day on average, including drop-off and pickups. This number can fluctuate depending on location, day and general timing. 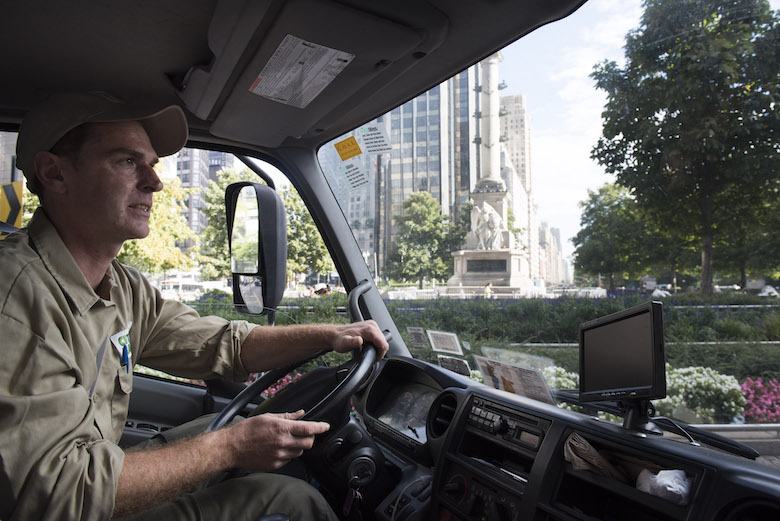 Earlier this fall I was paired with former cab-driver-turned-truck-driver Trevor to get a glimpse of his standard Upper West Side collection route. 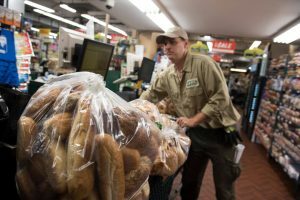 We started at the Long Island City Food Rescue Facility and, in the four hours I was out with Trevor, picked up donations from an anonymous grocery delivery company, grocery store and high-end fine dining restaurant as well as Fairway and Zucker’s Bagels. We ended our route with a drop-off at the West Side Campaign Against Hunger at 86th and West End Avenue. 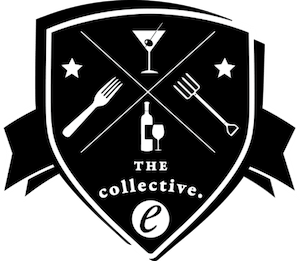 Ariel Lauren Wilson contributed reporting. 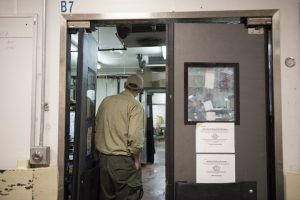 The warehouse is in the space of a former Budweiser Anheuser-Busch factory. 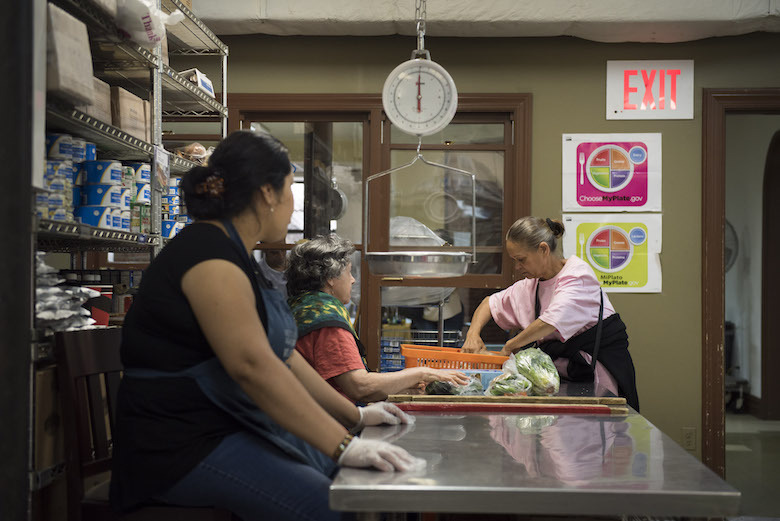 A worker at City Harvest setting up for a volunteer session. Some of the pickups show a hidden side of the city—the back hallways and anonymous corridors of the culinary world. Before entering certain buildings, all the trucks line up to go through a brief safety inspection. Here, a security guard slides a camera on a long, angled pole along the underside of the truck, checking for anything suspicious. 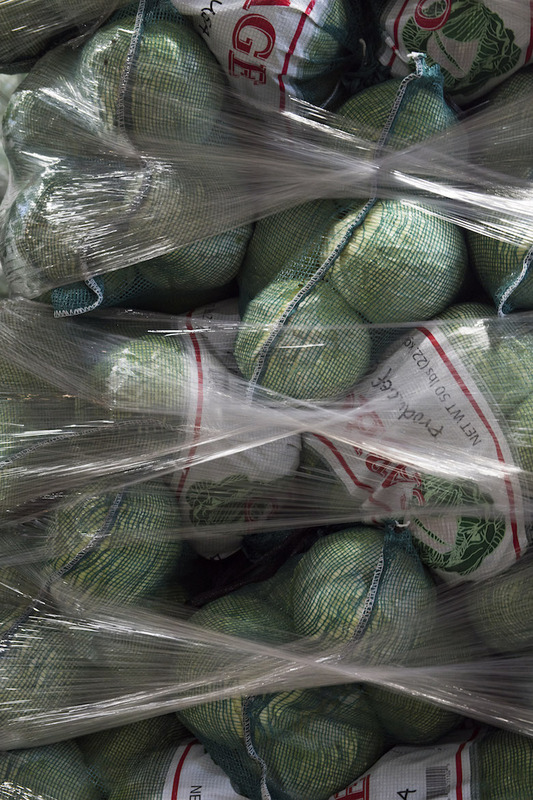 Fairway has carts of bread waiting for us upon arrival. Trevor wheels carts of bagels out of Fairway Market. 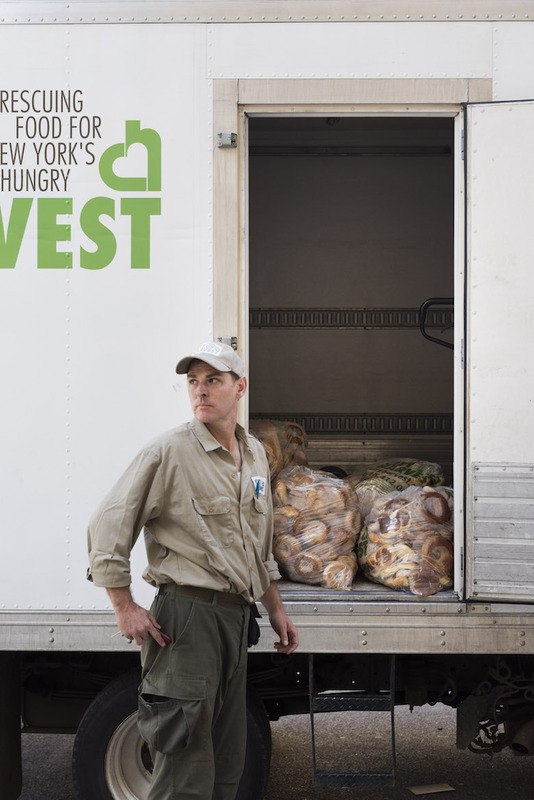 Volunteers of the West Side Hunger Campaign meet City Harvest on the sidewalk and help unload the truck. 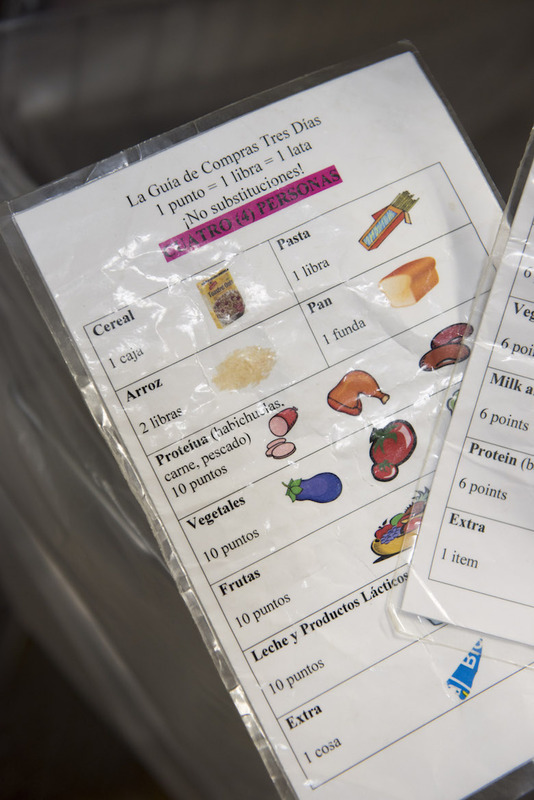 The points system at the West Side Campaign for Hunger is based on the number of people in your household and the USDA’s recommended ‘My Plate’ allowances. The space itself is small in scale, taking up a corner of the basement in the Upper West Side’s Church of St. Paul & St. Andrew. People wait in folding chairs in a room just outside the pantry since they have to limit the number of shoppers at a time. From 3:00 to 8:00 a.m., seven days a week, roughly 15 to 20 City Harvest trucks load up at their Long Island City Food Rescue Facility to make deliveries throughout the city. 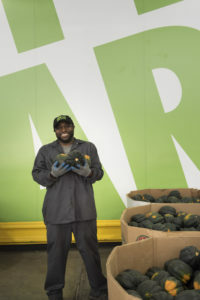 I met Trevor, pictured here, at the facility around 7:00 a.m.
To date City Harvest has rescued and delivered over 600 million pounds of nutritious food for hungry New Yorkers. 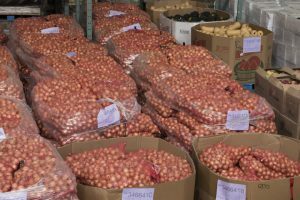 Visiting their Food Rescue Facility for the first time, I saw an endless vista of produce, a literal landscape of potatoes. 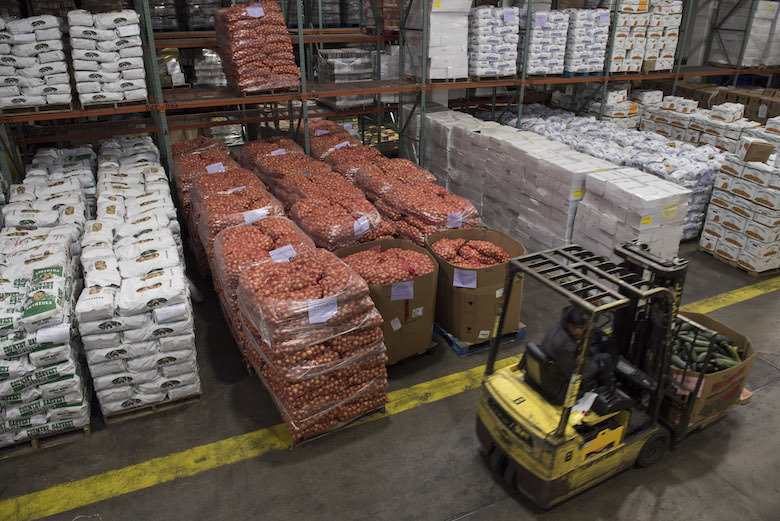 The warehouse is the home base to their entire fleet of 22 refrigerated trucks, a large refrigerator and freezer and a volunteer repack room. 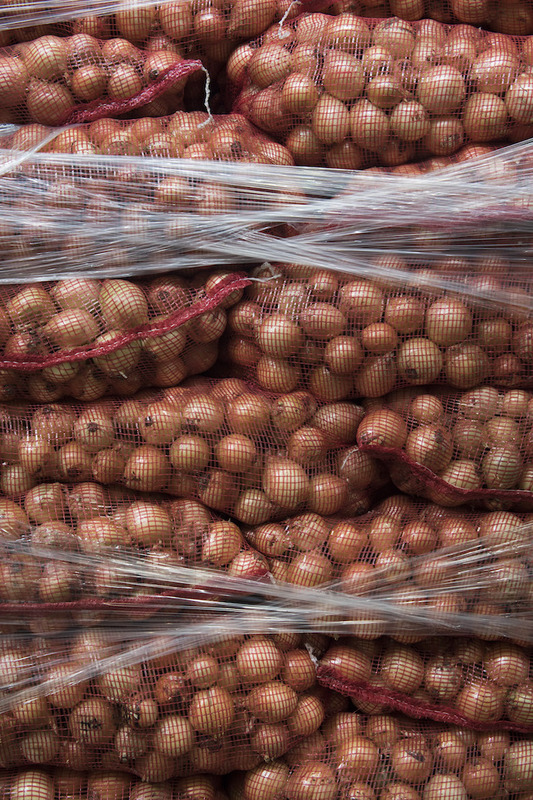 Workers in the warehouse joke about how mischievous pallets of onions and other spherical produce are; if a bag accidentally tears open, precious time is spent chasing after them. 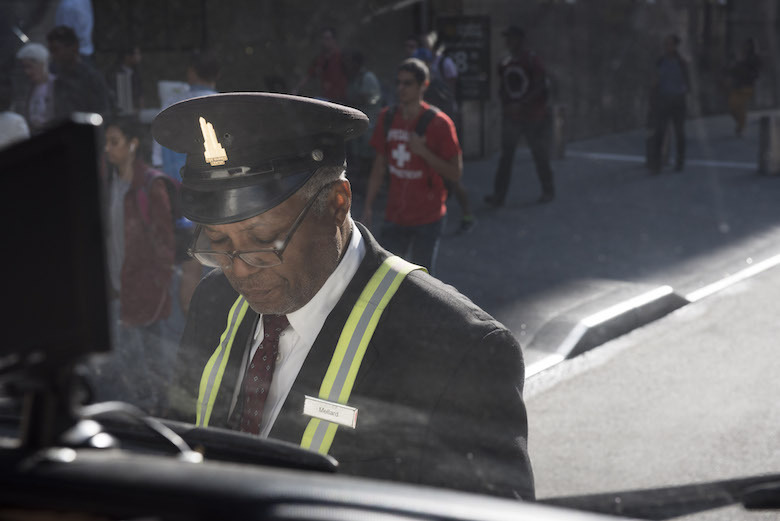 Even for nonprofits like City Harvest, parking tickets are inevitable in New York City. 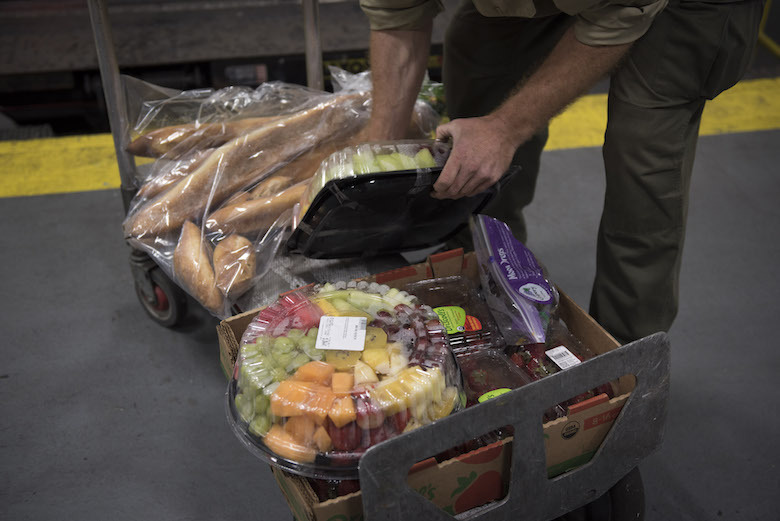 Trevor half-joked that the city might be more lenient with City Harvest trucks because of their mission, but the organization accepts these costs as part of doing business. City Harvest accepts nonperishable, perishable and prepared foods maintained in safe temperature zones and chilled or frozen before being donated. 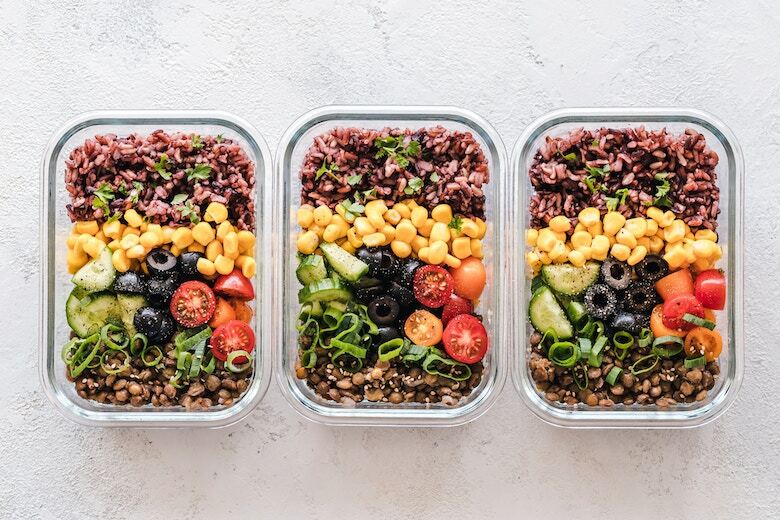 Plated or buffet foods are a no-go, and their food sourcing team works with food donors to ensure that all donated food adheres to these safety standards. 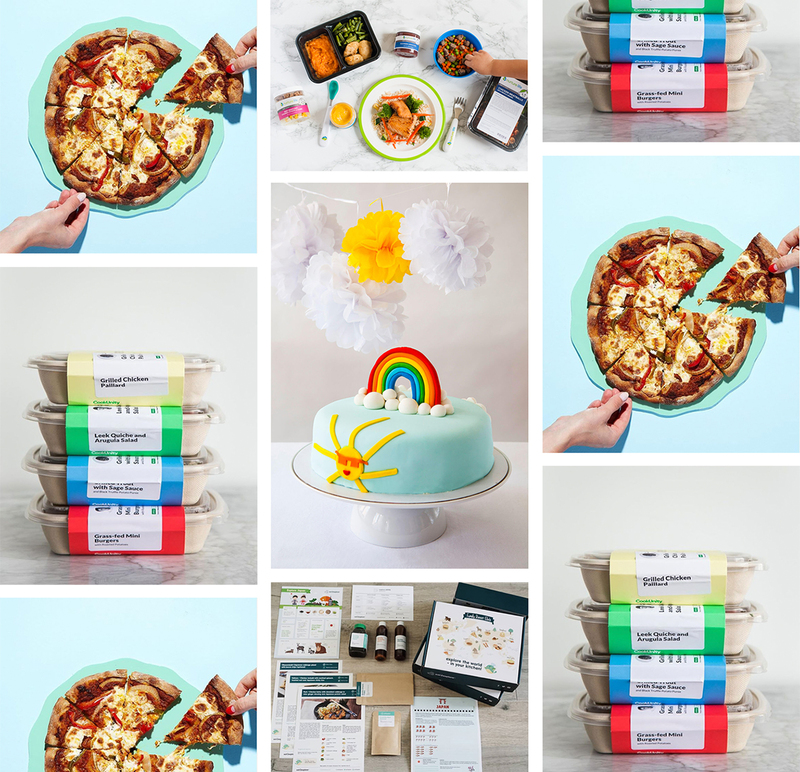 There’s no predicting what these donations will be each day; while some pickups are pretty standard—say a bakery’s daily leftovers—others are highly variable, like that one time Trevor received a 100-pound donation of dried mango. 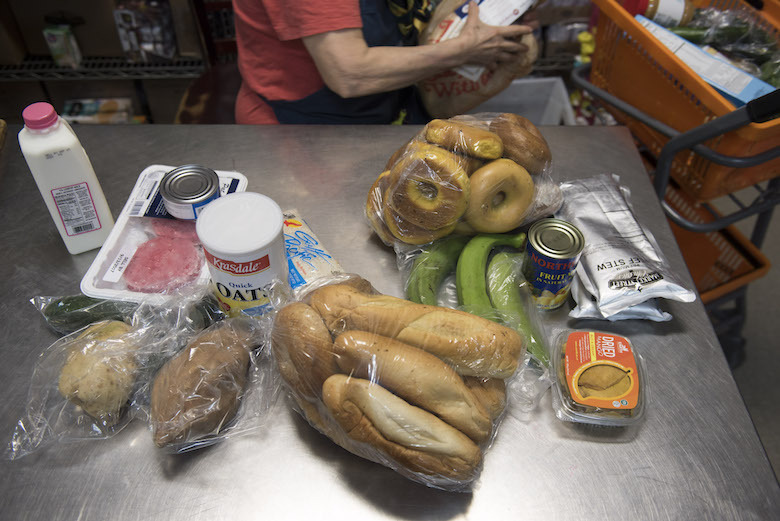 Forty-two percent of New York City households, or 2.7 million individuals—a population larger than the city of Dallas, Texas—are food insecure, meaning they lack the income needed to cover basic necessities like food, shelter, clothing and health care. 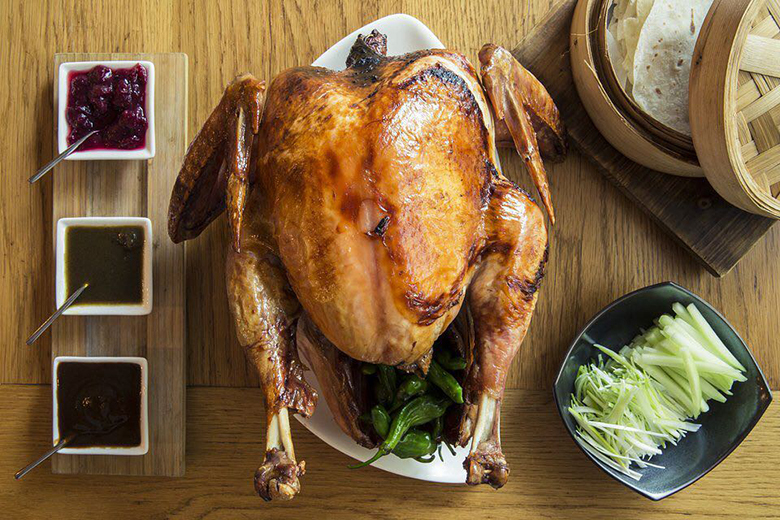 At the same time, 40 percent of food in the United States is never eaten. 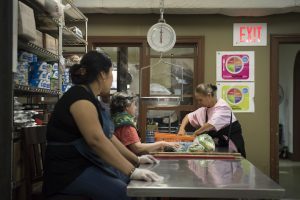 City Harvest works to bridge this divide, directing perfectly edible food to those who need it most. 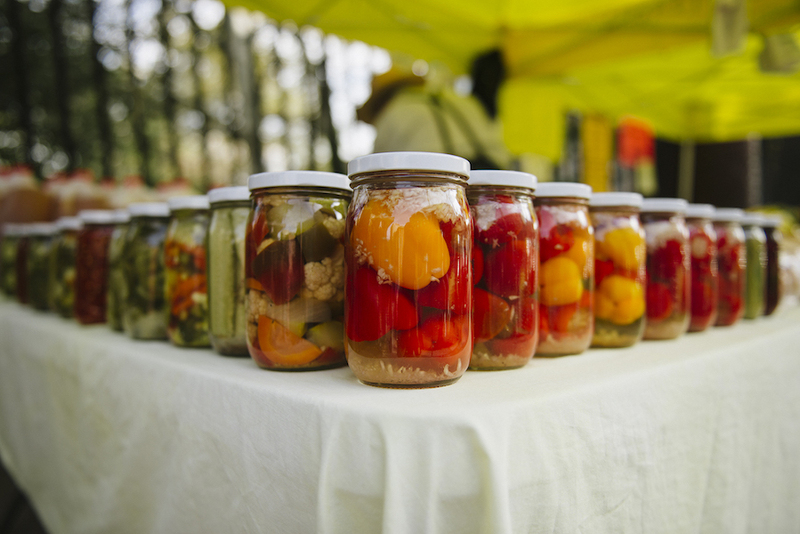 Seventy-five percent of the food City Harvest collects is nutrient dense, including fresh produce, meat and dairy. 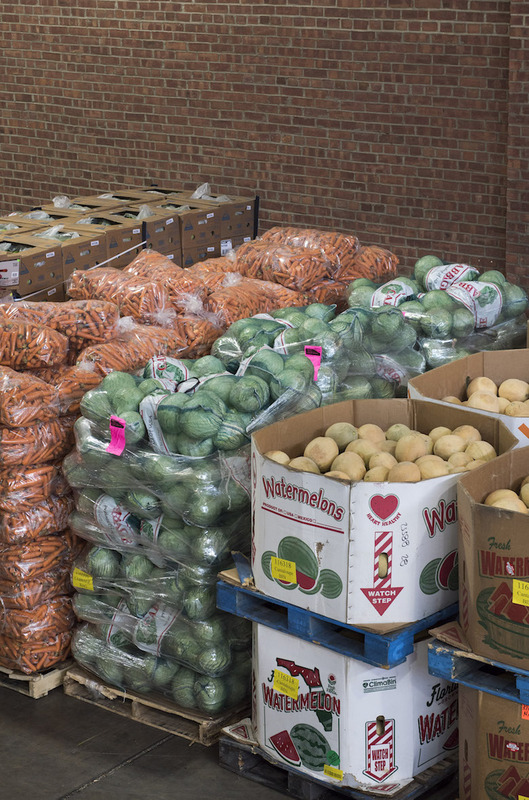 Overall the food rescue mission is a two-way street: it’s as much about salvaging potential waste as it is about distributing nutritious, perfectly edible foods. After making our pickups, we arrived at the West Side Hunger Campaign Food Pantry where volunteers met us on the sidewalk to help unload the truck. 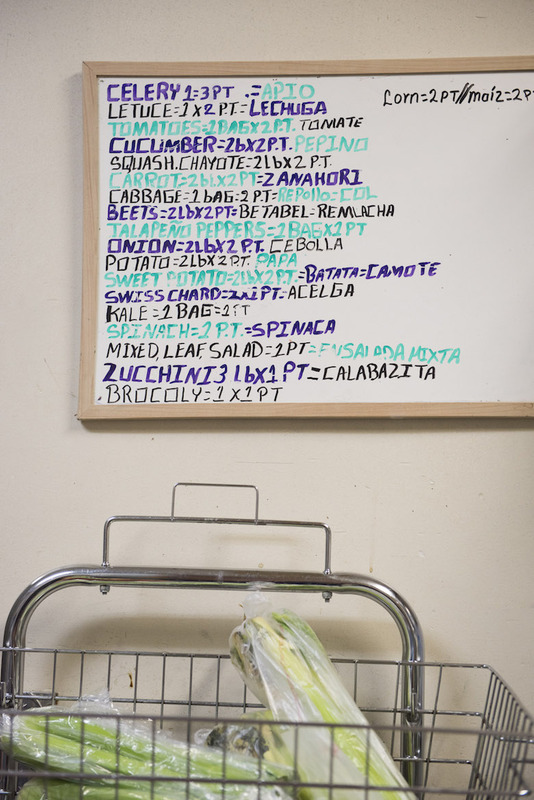 West Side Campaign Against Hunger operates as a co-op food pantry at West End Avenue and 86th Street. It’s mostly run by volunteers who are also customers. Back at the warehouse I’m told that City Harvest has a 1.25% waste margin of all the foods they process. When I look impressed by this seemingly low number, I’m told they are working to lower it even further as it’s still roughly 750,000 lbs of their annual intake.